The circus is in town! Hurrah! Last week the Cirque du Soleil set up its big top tent for its latest gloriously glitzy, jaw-dropping production, Volta. Presenting, as always, a ferociously paced but immensely enjoyable show, the company has changed since its first shuddery start in Canada in 1984. I saw the original US 1987 show at the Los Angeles Art Festival, the run that would vault the company into international success, and although the amount of shiny costumes has multiplied like fleas in August, the cirque remains the same: wonderfully trained young performers presenting daredevil acts with verve and finesse. 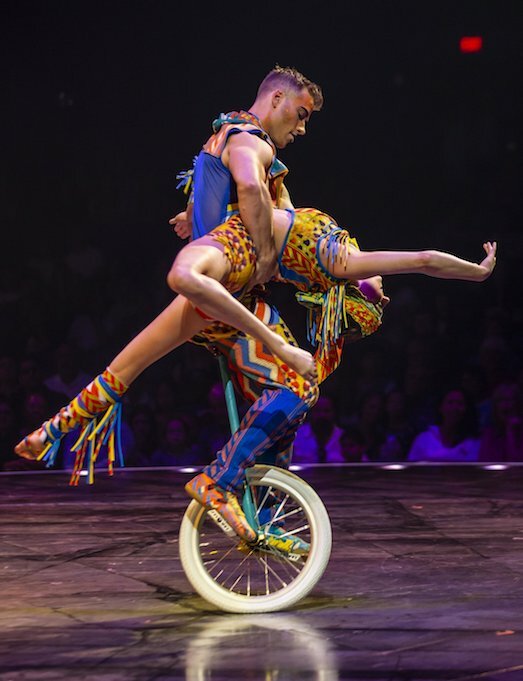 The shows are known for their continuous story that unites various international circus acts into a drama with matching décor. The story treatment is rather thin but sustains the idea – and a very true idea at that – that the audience has entered a fantasy world where the unimaginable holds sway. There is innocence and there is bravura. 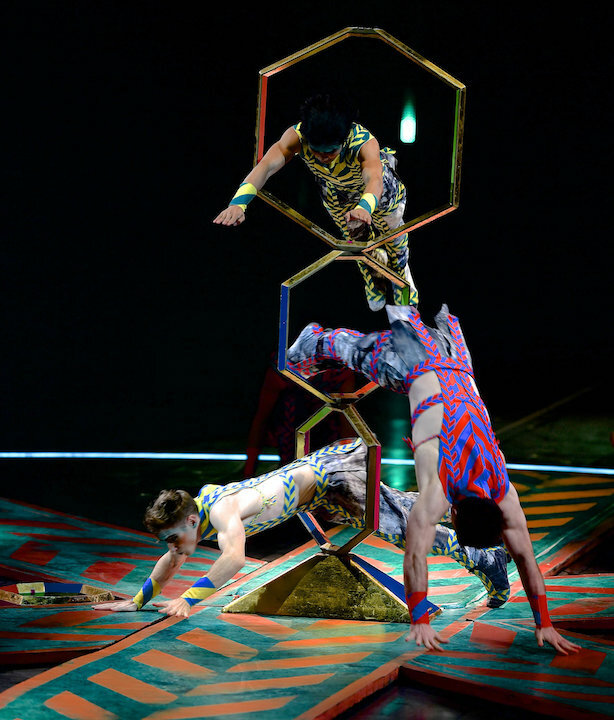 Shape divers cascade through turning hoops at the Cirque du Soleil’s “Volta”. Photo by Michael Kass. Volta tells of a young man, who tries to hide among the grey, cellphone-obsessed masses. He is unmasked as the fantastical creature he is: endowed with a mop of blue feathers rather than a head of thin and mousy brown hair. He takes on several transformations, as the guardian angel of the city, as a bicycle-riding child in a nostalgic memory of his adored and adoring mother. Finally, he learns to exult in his difference, while tumbling through a world of madcap performers. Waz, the character named, is performed by Canadian Joey Arrigo, who manages to transform a mix of ballet and acrobatics into an ethereal version of break dancing. You don’t often see that combination performed so finely. It made theatrical sense to have him dance opening and closing solos under the shifting laser-like lights of the big top. Another performer of profound grace was the Polish aerialist Pawel Walczewski, who was listed as the Guardian Angel in the City. With a head of blue feathers and costumed in feathery blue-gray, he used a large, square lamp hung on a wire as his apparatus. There was indeed something angelic about the precision of his moves as he turned and stretched slowly suspended high above the audience. And while most circus acts excite our emotions of thrills, wonder and excitement, his finely choreographed aerial work also evoked poignancy and a tender beauty. 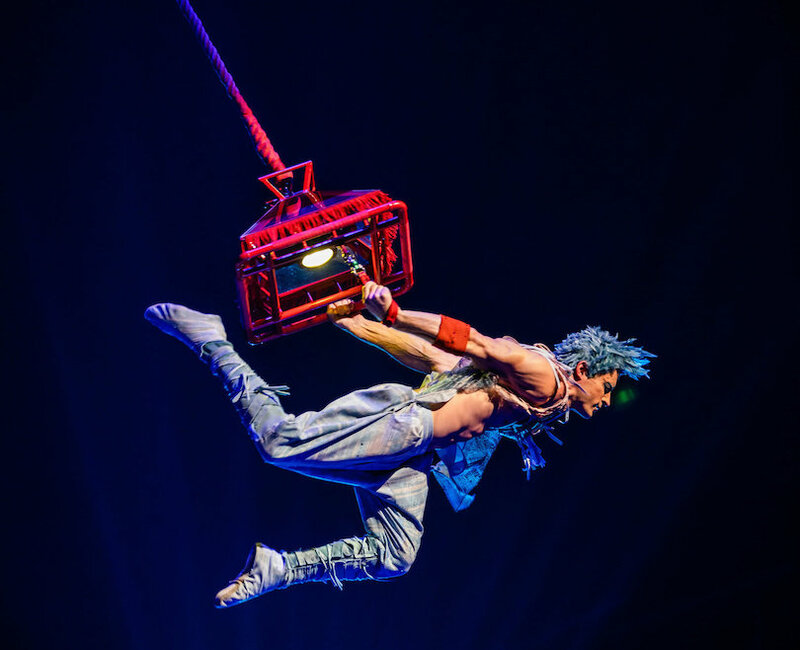 Aerialist Pawel Walczewski as the Guardian Angel in the City in Cirque du Soleil’s “Volta”. Photo by Matt Beard. A team of Japanese acrobats in gold lamé flew through ropes in a breakneck form of Double Dutch jump rope, tumblers careened off a huge trampoline climbing walls sketched brightly in neon colors, acrobats dove through precariously attached shapes that slowly turned and daredevil bike motocross (BMX) performers zoomed in synchronized patterns while twisting their bikes and themselves in reckless flips. In between the wildly kinetic acts, Russian clown Andrey Kislitsin, who first appears on-stage as a gold-encased Mr. Wow with a pompadour that would put Elvis to shame, wrestles with three recalcitrant washing machines and an invisible boy and his father at the beach. The British aerial strap duo, Andrew and Kevin Atherton, divided and swung magically in patterns between one and the other. Their twin bodies, trained to mesomorphic perfection, mirrored the mysteries of the self. Philippe Bélanger and Marie-Lee Guilbert in “Volta” at AT&T Park in San Francisco. Photo by Matt Beard. A juggler who works with the floor rather than the sky. A roller skater in an oddly Indian headdress to match vividly colored costumes. A man in a Cyr wheel. A unicyclist and his tiny but daring companion. A violinist in white wig and lemon knee-high boots. The costumes were designed by Zaldy Goco, who also designs for Lady Gaga, to mention only one: you get the idea. The popcorn is overpriced, but you’re not going for the snacks. This is the perfect holiday event, lightening our descent toward the solstice and the anxieties of the holiday season. The place was packed and everyone screamed and shouted in fervent admiration and joy. Cirque du Soleil’s Volta continues through February 3. For tickets and information visit www.cirquedusoleil/volta.